Earlier this month, the citizens of Hungary, a former communist country, elected Viktor Orban to his third term as as Prime Minister in a landslide victory, and his party won 2/3 of the legislature, which will allow them to change the constitution. Orban has accused George Soros of promoting Muslim immigration to remove national and Christian identity from Europe. 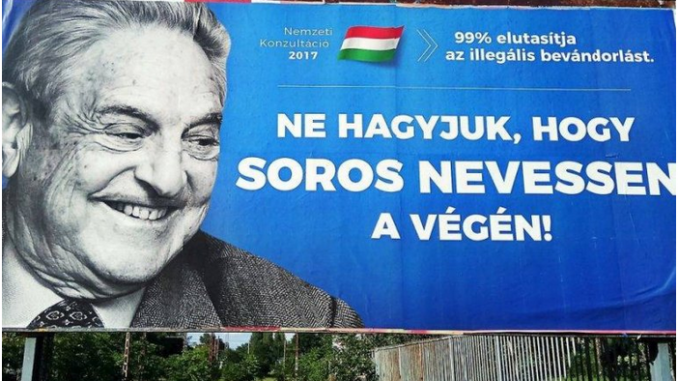 Orban’s campaign to “Stop Soros” includes legislation to ban any of the 55,000 NGOs (non-governmental organizations) now registered in Hungary that are deemed to be a security risk or that support immigration. NGOs that are allowed to operate will pay 25% tax on foreign donations. Orban’s regime is said to have used a sophisticated sting operation to spy on Soros-linked NGOs by posing as foundations offering funding. The ‘investors’ of the sham foundations asked pointed questions and obtained damaging inside information on the operations of the NGOs that were then leaked to the Jerusalem Post. Orban used this as proof that the Soros network was lobbying against Hungary internationally. Several of the NGO dupes reported that the phony foundation investors had Israeli accents. Israel’s Likud ruling party had previously admitted helping Orban in his campaign against Soros. In 2015, Soros tried to overthrow Netanyahu and his Likud party. Israel supports far-right-wing parties in Europe when they have a common goal or wish to monitor a European country that becomes ‘too’ vested in nationalism. Orban has been accused of taking over the media, and a Hungarian pro-government magazine, Figyelo, published the names of 200 of his critics, including journalists and NGO advocates, who he labeled as “mercenaries” working to bring down the government. Several weeks ago, tens of thousands or protesters demonstrated in the streets in Budapest against Orban’s control over the media, the closure of the Soros-funded Central European University in Budapest, and the Hungarian government control over civil society. George Soros’ Open Society Foundation has spent billions to manipulate civil society to pursue his goals in central and eastern Europe. Civil society is comprised of private organizations that are not part of government or business and are used for social and political influence. Examples are NGOs, non-profits, unions, political parties, PACs, and activist groups. Civil Society has become highly organized, using technology to create propaganda and organize large demonstrations and ‘spontaneous’ protests. Additional protests are planned. George Soros is reliant on NGOs to do his bidding in spreading propaganda and organizing massive demonstrations. Legislation against Soros-linked NGOs and exposing their long-term plans to the public is being implemented to dismantle his influence and power.